I’m Sue Griffey and I direct the Evaluation Center in the Public Health Research group at Social & Scientific Systems. I really like technology and the tools it’s given us – and I am always trying out new things. (I love the EZAnalyze program that Paul Pope blogged about a few days ago.) So, when I read about Wordle (http://www.wordle.net/ ) a couple months ago, I just had to try it – but on what? I decided to put the text of my biopara into it – and see what would result. Of course, I was glad to see that, as an evaluator, the word “evaluation” came out quite prominently. Since I came to my evaluation career through a variety of experiences and pathways, it was useful to see how those were reflected as well. It helped me see where some themes in my career and life came out as quite large visually. I reexamined how I wrote about those so that they didn’t override other information. I applied different templates in Wordle which also helped me see different visual themes and identify what I wanted to emphasize. Apply it to an executive summary of a business proposal. Does the major theme you’re emphasizing come through visually? Apply it to a conclusion section of a report or an article. Does the Wordle of the conclusion show proportionally what you think you said? What ideas do you have for how to use it? I have used wordle on different contexts before, but this is the first time I see someone giving such an analysis of it and its impact on herself. Or to put it more simply, it is a data VISUALIZATION tool, not a data ANALYSIS tool. I think the main distinction that is important here is that Wordle is useful to create a visual of data AFTER they have been analyzed. This does seem to have great potential, especially with quantitative data. Where I am concerned is with people using Wordle on un-analyzed qualitative data and then interpreting the picture as identifying the important themes. Wordle is simply counting frequency of words. True qualitative analysis is not counting how many times something was mentioned. It still requires a human to do real analysis, organizing the data with the context and evaluation questions and goal in mind. I’ve used this for Executive summaries, like you suggest and it was received very well. One way that I have used it is on basic feedback forms for sessions to ask people to write three words to describe the day/training etc. Then use the wordle to share it visually. Another site that does the same thing is tagcrowd.com. It allows you to upload files which is convenient, but it doesn’t have all the same controls and options as wordle.net. One setting to be careful of is the vertical and horizontal orientation, since it really influences what people attend to. I’ve used Wordle and very much enjoy it. There are many ways to customize your word cloud. You can even select words to be removed from analysis, in addition to those that are eliminated by the default settings. 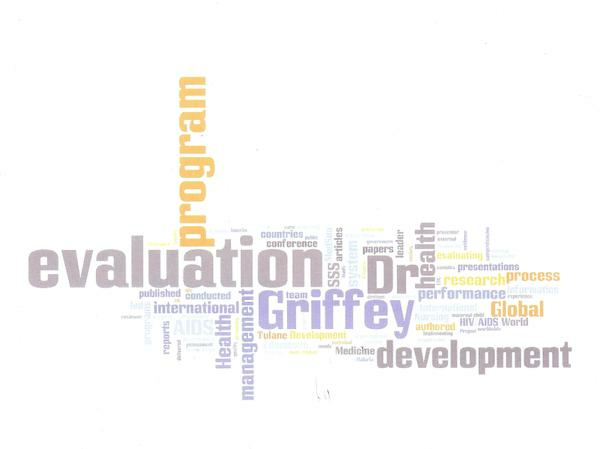 I’ve actually used a Wordle for the introduction to a final report for a client. As for saving, you can, but it’s not always easy. Look at the FAQs page on their site for more detailed directions of how to do this. One way to save is to take a screen shot, then paste it into a paint program. You can copy and paste from there into your word processing program. Thanks, Nicole, for a great idea about how to use Wordle! I’m not a huge tech tool user, but I really liked this. I threw in my bio and like yours, “evaluation” was the most prominent word. Validating, since it’s what I do for a living 🙂 My new project will incorporate a lot of qualitative, thematic analysis, and while I wouldn’t tell my client to “look at the Wordle as this is your final report”, it could make a really neat cover page or visual addition to a report as the wordles are pretty arresting and at least for me, would make me want to see what’s behind the cover. You could also use a wordle in a poster presentation. Even if it is quantitative, throw all your variables in the wordle program and see what you get. Again, not the meat of the poster, but could be a cool border or title slide and might draw more attention to your work. But a big question – it looks like you can save your wordles to a public page, but not save them on your own drives. Do you know if there is a way around this? I have had a similar experience, since the initial Wordle posting. Some colleagues and I were beginning an evaluation of a new campus program for students. A few members of the committee were concerned about the appropriateness of the selected comparison group. Besides the basic quantitative comparisons between our measures, Wordle assisted in a quick visual comparison of the qualitative demographics, such as major, personal identity, and training background. A thorough qualitative assessment will be conducted on more prominent responses throughout the evaluation, however Wordle did assist in clarifying similarities and differences to our group (relatively non-research oriented) in a quick and easy manner!